Richard Strauss: Symphonic Rhapsody "Elektra"
As part of a European tour the Pittsburgh Symphony Orchestra and their music director Manfred Honeck paid a single visit to Belgium. Their Brussels program encompassed the classical elegance of Haydn's 93th Symphony as well as the dissonant expressionism of Strauss's Elektra in an orchestral adaptation, allowing us to appreciate the excellence and the generally high-octane performance style of the orchestra. There is little doubt, however, that for most in the Brussels audience, the return of the acclaimed 25-year-old Russian pianist Daniil Trifonov in Rachmaninoff's 2nd Piano Concerto, made the icing on the cake. The magnificent Haydn 93rd Symphony, one of the earliest in his London series, was delightfully performed – luminous, lively, and witty. Any fears that with such a large formation Honeck would treat us to some outmoded big band, string-driven Haydn were soon dispelled by the transparent, antiphonally placed Pittsburgh violins radiating warmth and elegance, and by his impeccable phrasing. The string quartet opening the second movement provided a striking contrast and Haydn's ever-inventive orchestration, including remarkable solos from principal oboe Cynthia Koledo DeAlmeida, was always carefully exposed. Honeck gave the Menuetto an irresistible swing and rounded off with an imaginatively paced Finale. Imagination was also running high in the Rachmaninoff concerto, but here the results were far less persuasive. Daniil Trifonov possesses – need one repeat it – a phenomenal technique which effortlessly deals with the work's virtuosic demands and allows him to conjure the most astonishing sonorities from his instrument. But just as in his traversal of Rachmaninoff's Third, which I heard in London last year, I was left with the feeling that bigger structures seem to elude him and this was mainly work in progress. Trifonov's playing was sonorous and crystal-clear, even in the most demanding passages, and I haven't heard that many pianists in concert who aren't drowned out by the orchestral tutti, yet eventually this turned out to be part of the problem. 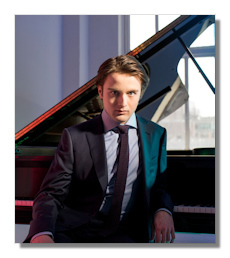 Trifonov seems to treat everything as a solo part and hardly ever takes a back seat. Every note, and we all know Rachmaninoff gives us many, is highlighted in his hands. This surgical treatment often reveals unheard details but also stretches the longer lines to breaking point. His preference for slow tempi and lingering mid-way may be considered as expressive freedom but when pushed this far they undermine the musical sweep, as in the first movement where he reached the sonic limits of his Steinway too soon, only to hold back immediately afterwards and flunk the Maestoso passage with loudly hammered chords. The first movement took forever to end and blurred the contrast with the following Adagio sostenuto. In the second movement, with Trifonov's microscopic, meandering approach the overall effect was overwrought rather than affecting. Truth to be told the sense of fragmentation was reinforced by Honeck's reliance on extreme dynamic shifts. The fortissimo orchestral passages, topped by the brass section overpowering everybody else, were simply too demonstrative. By the time they reached the third movement Trifonov was in characteristic vein with his nose on the keyboard, sweating profusely, as if in a trance. It was sufficient to convince the Brussels' audience they were in the presence of greatness and give Trifonov a standing ovation. Trifonov is a remarkable pianist, let there be no doubt. Yet compared to some of his generation from the Russian school, like Dmitry Masleev or Behzod Abduraimov who both featured in the Rachmaninoff festival in Rotterdam last September, he still has some way to go. What may have sounded loud in the Rachmaninoff was dwarfed by what the orchestra had in store after the interval. But here the sonic excesses were duly warranted. The Elektra Symphonic Rhapsody had been the crowning achievement of the Pittsburgh's Symphony's homage to the composer's 150th birthday in 2014. Manfred Honeck and composer Tomas Ille bravely arranged a 35-minutes suite from Strauss's extraordinary opera and while I have never been a great fan of such posthumous opera-without-words medleys, at least this Elektra Rhapsody proved a cleverly convincing showcase for the orchestra. No matter that those unfamiliar with the opera plot will remain mostly in the dark as to what this music is depicting – with the characters' leitmotifs and chords preserved a synopsis might come in handy – one can revel in the stunning sound world of Strauss at his most daringly avant-garde. The arrangers made sure to balance tension with texture and a massive Pittsburgh Symphony Orchestra captured the changing moods, from lyrical to brutally terrifying, with aplomb and utter conviction. The outsized brass section and percussion could easily have stolen the show, if it wasn't for the continuous quality of the string playing. In short, a fitting tribute to Richard Strauss, but foremost to the Pittsburg Symphony Orchestra clearly in splendid form.